Perhaps more than any other Republican running for president this year, Minnesota Rep. Michele Bachmann has railed against taxes. She says they're too high, and that the current tax code should be repealed. But Bachmann had a somewhat surprising early career: going after tax evaders as a prosecutor for the Internal Revenue Service. At times, the congresswoman and former state senator has seemed to deny that for nearly her entire professional life, she's been on the public payroll. At a GOP presidential debate in New Hampshire earlier this month, she said she's spent her "whole life in the private sector." "She went on to earn a degree in tax law from the prestigious College of William and Mary, and served as a tax attorney for the United States government." Repeated requests to speak with Bachmann about her time as a federal tax attorney all went unanswered. But on the campaign trail, she's made that part of her resume a selling point. "I'm a former federal tax lawyer. I get how devastating high taxes are — I've seen it," she said at a campaign stop in Columbia, S.C., in August. There, she did something she rarely does: She talked about exactly which part of the federal government she'd worked for. "How many of you love the IRS?" she asked, receiving a chorus of "Noes" in return. "It's time to change it. I went to work in that system because the first rule of war is know your enemy. So I went to the inside to learn how they work, because I want to defeat them." But Minnesota tax attorney Genelle Forsberg says she doesn't think Bachmann worked at the IRS to infiltrate it. "I think she came there for a job." Forsberg worked alongside Bachmann at the St. Paul IRS legal office during the more than four years Bachmann was employed there, beginning in 1988. Forsberg has since left that IRS office, where her husband is still senior counsel. 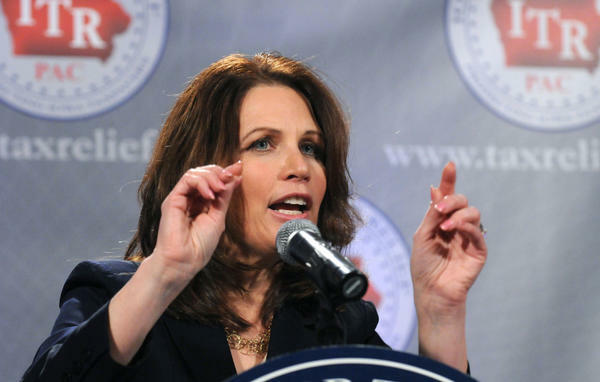 She says she never heard Bachmann say anything back then about getting to know the enemy. "She had indicated to some of us that she really wasn't interested in taxes — this was a job that she got, and I think, you know, she was learning as she went," says Forsberg. "But I didn't see any indication that she was ambitious in making tax law her career." The IRS would not authorize a visit to its St. Paul office. But some of Bachmann's former co-workers say that much of the time she was employed there, she was not actually on the job. Forsberg says that while she herself generally took about half a dozen cases to tax court each year, records indicate that Bachmann litigated only two court cases the entire time she worked for the IRS. "She and myself, we both had two maternity leaves during that period of time that she was there, so you obviously wouldn't have a case during that period of time. But I would say, on average, most people would have more cases for litigation than that," she says. In 1992, Minneapolis attorney Mary Streitz was a pro bono defender at one of the two trials Bachmann litigated. "I remember her as a somewhat tall, slender woman with a lovely black houndstooth-checked two-piece suit," Streitz recalls. The case, she says, did not involve much money — a Native American named Marvin Manypenny was charged with failing to pay $5,980 in taxes on about $30,000 earned over a three-year period. "That sort of case probably never would have been tried if he hadn't been making the arguments he was making about his Indian status, and if he hadn't felt so strongly about them," Streitz says. "If I'm not a part of the people of the United States," he said, "then, you know, how is it that I'm obligated to pay taxes as a full-fledged citizen?" Native Americans, Manypenny maintained, have not been recognized as full citizens by the U.S. Constitution. He describes then-IRS prosecutor Bachmann as "blunt" and "curt" in the courtroom. "But I don't think she understood my points that I was trying to make constitutionally, and that kinda surprised me, in that, you know, her being an attorney," he says. "I don't think she grasped, you know, what I was contending." Still, as Manypenny's former counsel Streitz points out, Bachmann did win that case. "I thought she did just fine," Streitz says. Within a year, Bachmann would leave the IRS to start a Christian charter school and pursue her next career — as an anti-tax politician.